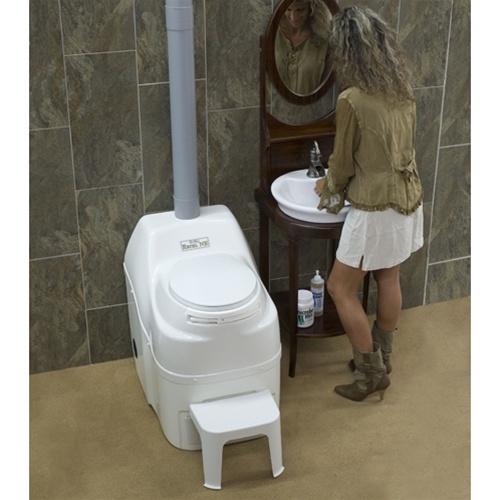 The Sun-Mar EXCEL AC/DC is our "hybrid" self-contained composting toilet. With its ability to operate either electrically or non-electrically, it offers you the best of both worlds. The EXCEL AC/DC is the preferred unit for those who are running on generators, experience frequent power outages, or do not have electricity now, but expect to in the future. The Sun-Mar EXCEL AC/DC is equipped with all the standard electrical features of the EXCEL, including a thermostatically controlled heater located in the base of the unit and a fan assembly in the rear top of the unit. In the event that the electricity is out, the EXCEL AC/DC is also equipped with the features of the EXCEL NE, which include a 4" vent stack running straight up from the unit and a 1" safety drain connected in the back of the unit. Depending on whether or not electricity is present, either the fan assembly or the 4" vent stack will maintain a partial vacuum in the unit to ensure odorless operation. The EXCEL AC/DC is a waterless unit, which means an easy installation because there is no plumbing to worry about. When there is no electricity, however, the evaporating capacity of the EXCEL AC/DC is variable. This means that it is important to hook up the 1" safety drain when you install your unit. A 12 Volt fan is included with the EXCEL AC/DC. If the unit is going to be used residentially or heavily, or if it's in a location that may be subject to downdraft, this fan should be installed in the vent stack. This fan draws 1.4 watts and can be powered by a solar panel and/or 12 Volt battery, neither of which is included. 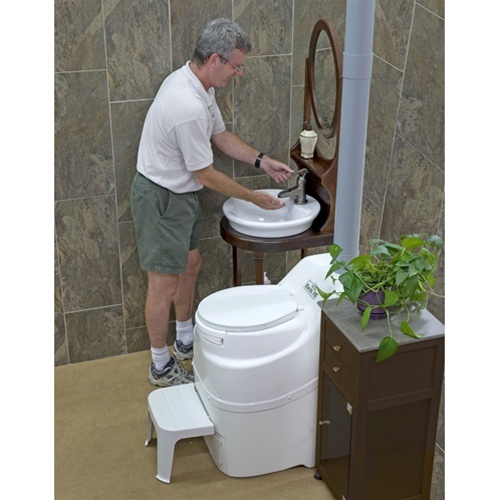 The Composting Toilet Store does sell separately a 10 watt Solar Panel that can be used to power the 12 Volt fan that comes with your EXCEL AC/DC unit. Please see the Solar Panel page for more details. 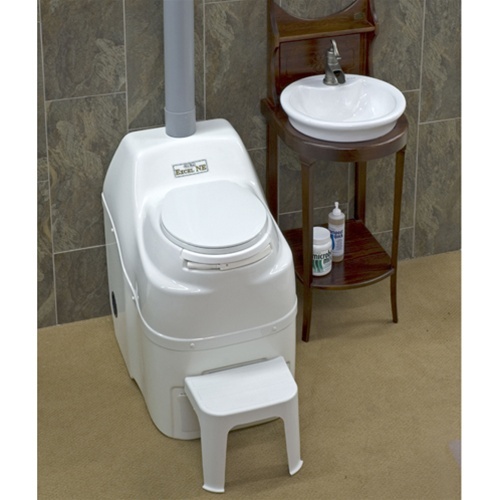 Sun-Mar's EXCEL family of self-contained composting toilets are the world's only self-contained units to be NSF certified to operate odorlessly and producing a clean, dry compost. 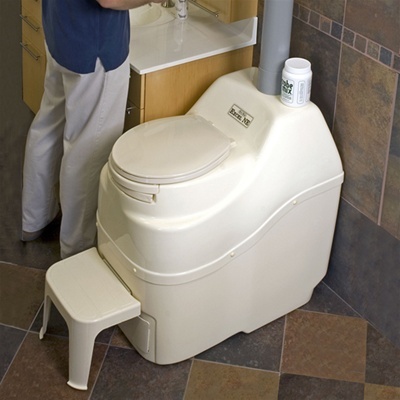 When you purchase an EXCEL, you are literally purchasing the unit that sets the standard for self-contained composting toilets! For initial start up, add some Compost Sure (peat bulking material) into the Bio-Drum™ together with some Microbe Mix. 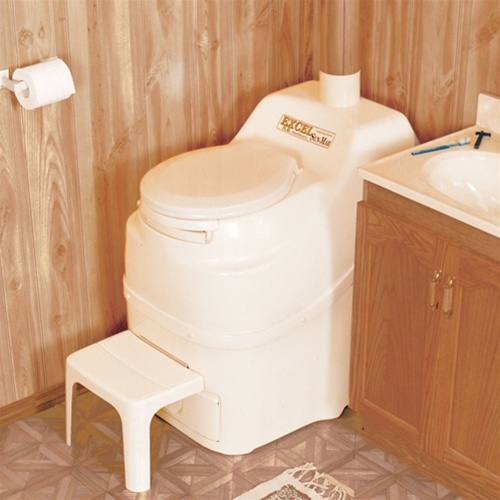 You may use your favorite toilet papaer, the composting toilet will compost it without a problem. For day to day operation, add Compost Sure as specified in the product instruction manual. Every 2-3 days (while unit is in use), rotate the drum 5 or 6 full revolutions. For weekend use, just rotate before you leave at the end of the weekend. 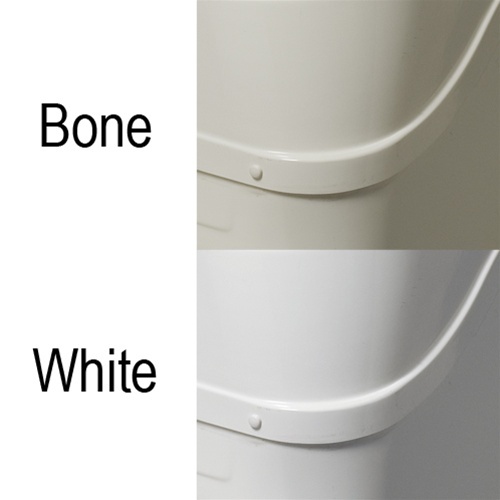 When the Bio-Drum™ is half to 2/3 full, some of the compost should be moved to the finishing drawer. This is accomplished by releasing the drum lock and rotating the drum backwards. 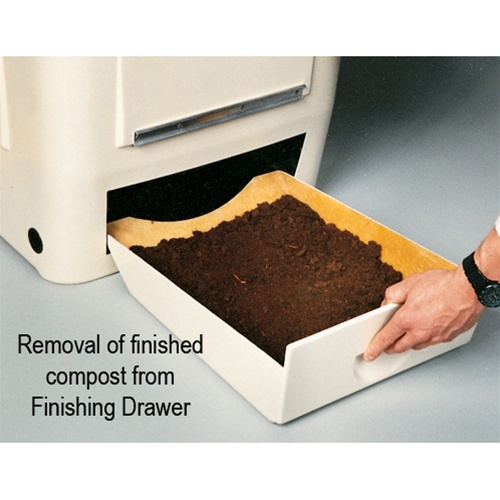 Finished compost drops automatically into the finishing drawer. This process takes less than a minute, and most importantly, you never come into contact with fresh material. The compost is left there for at least 4 weeks so it can finish and sanitize. In the finishing drawer, it will be isolated from contamination by fresh material in the toilet. Once 4 weeks have passed, you can remove the finished compost from the finishing drawer at any time, no tools are needed to open the drawer. Add the finished product to your flower garden! The final compost is clean, dry, non-offensive, and sanitary. It will look and smell just like any other regular compost that might come out of a garden composter. Please note, the Excel AC/DC is comprised of the Excel standard electric unit plus an AC/DC Conversion Kit. See Instruction Manuals below for more information. When operating electrically, a thermostatically controlled heater warms liquid in the evaporating chamber for fast evaporation, and a fan in the top rear of the unit ensures odorless operation. When electricity is not present, the 4" Vent at top rear of the unit maintains a partial vacuum, also preventing any odor. Height (footrest to seat): 18"
Depth required to remove finishing drawer: 46"
Height to center of 2" vent: 28-3/8"
Height to top of 4" vent outlet assembly: 36"
Birch Pond Lodge uses your products and has figured out how to keep a composting toilet working year round in an off the grid cabin which sees winter temps to -40 F. We also have been pleased to have been selected one of the top 10 eco-lodges in the world by Outside Magazine, March 2003 and one of 25 great eco-lodges in an article in Travel & Leisure, July 2003. I thought I would pass along this good news to your firm. We are located 70 miles north of Anchorage, Alaska and our cabins overlook pristine lakes and ponds. 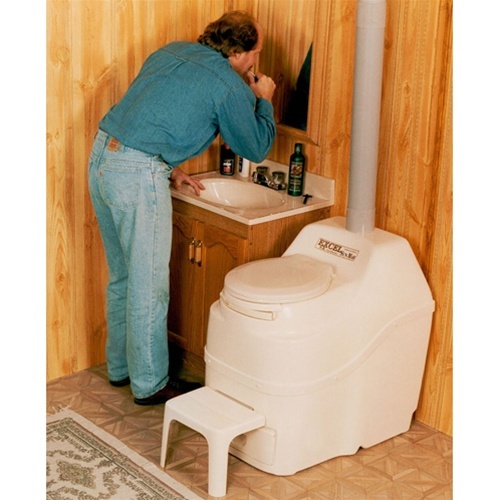 Using Sun-Mar composting toilets has solved the problem of disturbing the ground for a septic tank and drain field and eliminated the possibility of contamination of our lakes and ponds. Our concern was finding a way to keep the composter working in winter in a stand alone cabin which is not always occupied and thus not always heated. We solved this by building a well insulated bathroom within the cabin which is heated when necessary using a direct vent propane heater. In future cabins we will experiment by designing in some solar heat gain where siting allows to minimize the propane use. You are welcome to share the content of this letter as you wish. Thanks for supplying a good product.